Stellarium can be your own pocket planetarium and is available for all major platforms (including Android). http://stellarium.org/ wrote: Stellarium is a free open source planetarium for your computer. 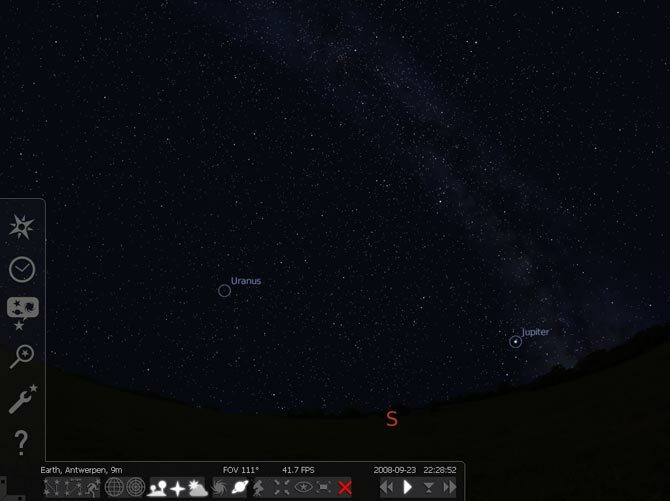 It shows a realistic sky in 3D, just like what you see with the naked eye, binoculars or a telescope. It is being used in planetarium projectors. Just set your coordinates and go. Download Stellarium Portable (currently v0.13.0) from http://portableapps.com/apps/education/ ... m_portable. Stellarium for Windows upstream version is at http://sourceforge.net/projects/stellar ... ium-win32/ (full changelog for the current version is at http://launchpad.net/stellarium/0.13/0.13.0). Although just to note but the android version is a port by a different author. Anyways, great applications. I wish I had the money to get a fisheye lens and set up a house planetarium with this program (it supports it). That would be AMAZING. Upstream Stellarium v0.14.2 released (changelog at sourceforge.net/p/stellarium/news/2016/01/stellarium-0142/). Upstream Stellarium v0.19 released (changelog at https://github.com/Stellarium/stellarium/releases).